How true! 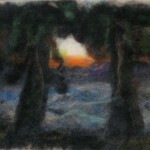 My partner in all things sheep/fleece/fibre, Linda, is a lifelong artist, and when she discovered needlefelting it was very inspiring. 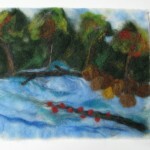 We also call the workshops we offer “painting with fleece” — that describes the process so well. The wonderful thing about needlefelting is how flexible a craft it is. People engage with it in a very personal way and can create very satisfying pieces at any level of experience. I hope you can connect a lot more people to this wonderful craft.